No mention of Mrs. Malaprop? I am reminded of a day in college when we were discussing someone who had problems with using the wrong words and a friend of mine said, seriously, "Maybe he just can't talk it good." Indeed. How fun! 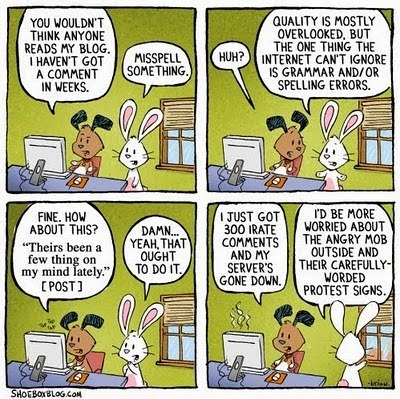 And yes, Mr. Lopresi, I too thought of Mrs. Malaprop! But the puns were particularly nice addition to the malapropisms! What a nice Monday morning read! Very funny stuff, Fran. Thanks, it was a nice start to the week. Rob, don't know why I didn't think of Mrs. Malaprop, but the only reason is that I didn't think of her. Anon and David, thanks for your comments. Hope all of you have a great week. Great piece, Fran. Nice to start Mo nday off with a smile. Years back when I was teaching legal writing I had a student who absolutely consistently used "of" instead of "have" (e.g., "The court should of ruled against the defendant.) On her first paper I circled every one of them and gave her a C-. In our conference reviewing the paper she calmly explained to me that I was being unfair, and that this was just the way she had always written. I listened, smiling, and told her that the C- was, in fact, a gift and that if this happened again she would get an F. Well, it didn't. Tough medicine but without a smack in the face this kid was otherwise never going to get a job! Fran, the barbell one reminds me of the baseball one I heard: "He wondered why the ball kept getting bigger, and then it hit him." 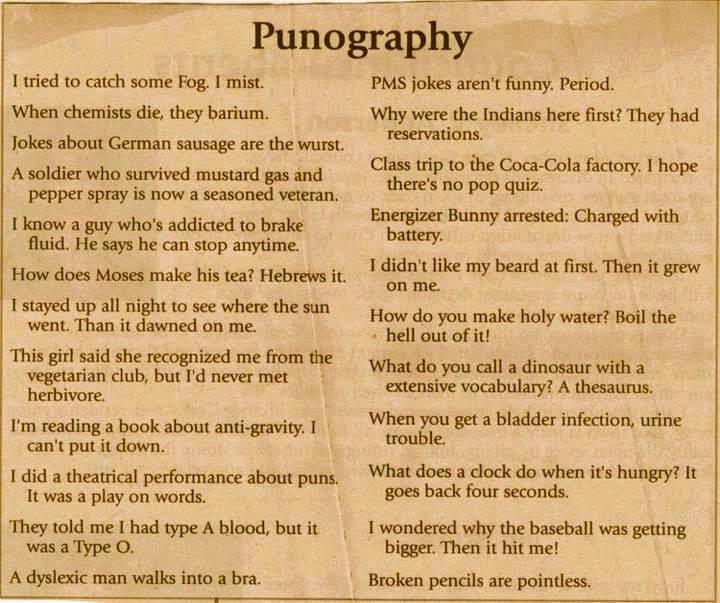 Great puns! I loved them all. Dixon, I agree that Dale's student was lucky to have him as a prof. Too many teachers these days either don't know correct form themselves or think they are being mean if they try to teach students the rules that they will need to abide by in the adult world. I'm glad both of you enjoyed these humorous efforts, none of which were original with me, but all of which amused me also. I'm online but don't know for how long. Thanks for covering for me. I keep saying I'm going to get an emergency column up but still don't. But I will cover you next week, Fran. You're collum is phunny fer sure. Thanks for the laugh. I thought of Mrs. Malaprop. I never saw the play but my husband had seen it and mentioned it several times. Hope everyone has a good week. I'm going to the wedding of a cousin tonight. She's been single a long time, is a grandmother, am so happy for her. At 50 she deserved happiness, aft raising 3 kids alone. Ha! 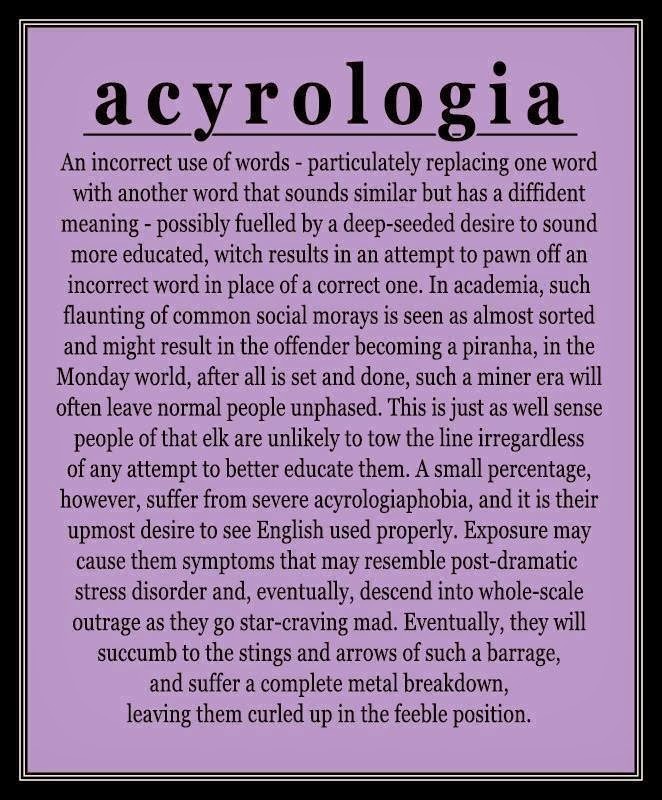 Clever mispelled word! I didn't catch it the first pass and had to go back again! I liked the post dramatic stress disorder and the PMS jokes aren't funny. A friend insists the first two letters in PMS stand for premeditated murder. I have a friend I grew up with that had a hearing issue, she pronounced 30% of her words wrong, and after trying to get her to say it right a couple times she got frustrated. My grandma and her mom always said things wrong, with my grandmother one example: we have a park, potter park, she says parters park all the time, and her and her mom both took tarlinol for pain. 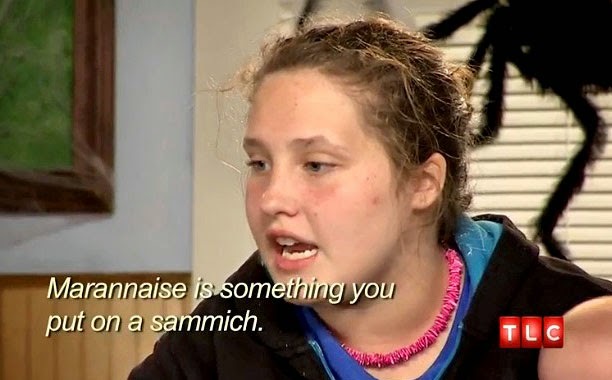 She wiggthrow a fit and yell if we correct her, so with here comes honey boo boo you think nobody could be that ignorant, but I am surrounded by it.